Nate read a story the other day about a little girl turning eleven who realizes she is not simply eleven, but all the ages she has been. I have this feeling, especially at Christmas. I am this nearly 47 year old mother of four, wife, and daughter. I am immersed in the memories we are creating in our home. I am present as we bake cookies and hide elves. I am fully immersed in watching Maddie absolutely squeal in delight at a surprise letter from Santa the elves brought her. The excitement of Nate in helping to decorate and transform our house is contagious. The sights and sounds of the season draw me in every year. And yet…as I sit in the coffee shop for a few minutes, memories strike me and suddenly I am a child again. Listening to Christmas playlists, I am taken back to the house of my childhood. The sights and sounds of New Mexico fill me with a mixture of delight, sentimentality and sadness. A yearning for what is just not quite right now. My Mom amazed me in her ability to create an atmosphere. She loved to say that the house came alive every Christmas; it puffed itself up and delighted in all the trimmings. She created a wonder-filled home. The culmination came on Christmas Eve as we gathered around an enormous table filled with a meal we only ate once a year. Tiny cinnamon rolls, potatoes au gratin, asparagus, and a beef tenderloin which melted in your mouth. Shrimp cocktails and cheese sticks and egg nog and other treats started the evening. My grandparents would arrive and we would sit around munching on cheese sticks and talk. I wish I could remember more clearly the conversations. I simply remember the atmosphere. Everyone dressed up in Christmas sweaters and my velvet dress. Shoes shined. Eventually we would move from couches to the table and have a long dinner. There was no rush, and even as a child I don’t remember wanting to rush away from the table. There was something magical about the table and the conversation. Eventually we would move back to the couches and sometimes act out the story of Joseph and Mary and baby Jesus. In our bathrobes with towels on our heads, held tight with belts. Some years Dad would simply read the story. We were waiting for the culmination of the evening. We would wander outside and watch the cars slowly creeping by, only parking lights lit, seeking out the luminaries through the neighborhood. Before the dinner and the cheese sticks, before the dinner preparations shifted into high gear, we would have lit hundreds of luminaries. On the roof of the house, lining both sides of the sidewalk. Our neighbors had done the same. There were no electric lanterns…we lit every tea light in those paper sacks. Christmas was filled with the feel of crisp, cold air and the smells of candles and meat roasting, of cinnamon and nutmeg topping egg nog. Still…the culmination was loading up in the car late in the evening and heading to the midnight mass at St John’s Episcopal church. Walking in with only whispers, trying so hard to stay awake. The room filling with more and more people dressed in velvets and reds and greens, and then suddenly the music beginning and the room filling even more with sounds and voices. Filling with the word proclaimed. I don’t remember if I ever fell asleep on the drive home. I remember getting to open one present on Christmas Eve. I remember strict instructions not to come down by myself, but wait until Dad came and brought me to he and Mom’s room to wait for my brothers so we could all come down together. I remember the anticipation. We didn’t have Santa Trackers, although I do think there was some type of tracker on television. Laying in my bed. Trying so hard to fall asleep, and finding it so difficult. After midnight service, it had to be well after 1am. Then….waiting….hearing footsteps on the roof and maybe bells? This didn’t happen every year, I don’t believe, but I know it happened at least once because it is firmly in my imagination of those days. All of these memories, filling my mind as I sit here in a coffee shop, taking me through the events of the evening and on into Christmas morning with egg casserole for breakfast and presents opened, all of these memories bring me joy. Delight. And yet, as I follow them, eventually they bring me to a deep sadness. Mom orchestrated the whole event. And it was an event. And now she has no idea. She has no delight in the music and the sounds and the sights. She no longer orchestrates. She trusts like a child in my Dad who helps her to know how to sit and stand and eat. She grasps tightly to his hand and she hums or whistles. She speaks, but the words have no cohesion or meaning. She, who would greet the guests at the door with a smile and warmth which immediately set the tone, now is unaware when people come to visit. She no longer knows us. She cannot delight in the the grandchildren who carry so much of her character and strength and humor with them. And they cannot know the strength of this woman who directed and orchestrated so much of my history. And so, in the midst of delight in the laughter of Maddie and the anticipation of all the kids for Christmas morning, in the midst of the sounds and sights and tastes of our Christmas, there is a deep sorrow and longing for something more whole. 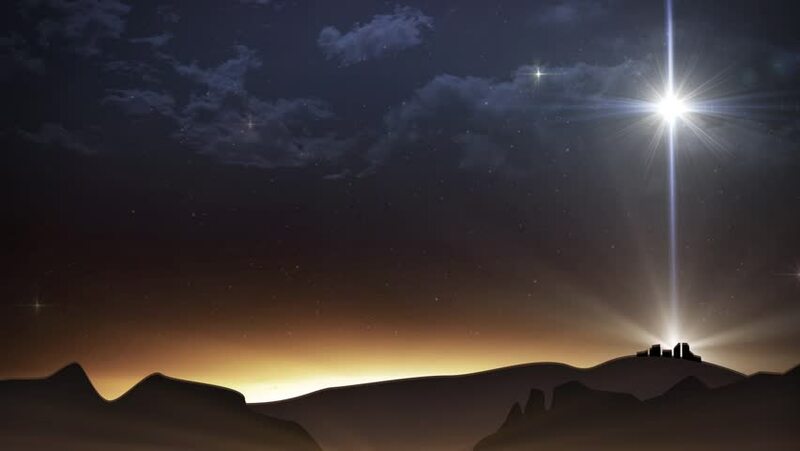 There is a longing for the true peace of Christmas, for a world ruled with truth and grace. There is alongside the joy and hope, deep awareness of brokenness. And that brokenness and loss does not detract from the joy and hope: it amplifies them. That longing for all to be made whole is there because joy and hope have been tasted. I wouldn’t know to long for a woman filled with grace and elegance and wisdom if I only knew her in her Dementia and confusion. We are marked by Eternity. The reality of Christmas moves us deeply because we have tasted of hope and joy. Some years Christmas may be difficult because the sorrow is more present, and the longing fills us to the point we have to fight back tears sitting in the coffee shop…but that longing is holy. That longing is the mark that we are created for something more than just what is in front of us. Listen: that is not some quaint story of the baby Jesus, cute and tame. That is the story of God wrenching open our reality and stepping. This is what we wait with held breath for, this is what we seek in this Advent season filled with chaos in our world and brokenness as far away as those we love. This is God stepping in to our brokenness and promising healing and hope. Sing the songs this Christmas. Bake the cookies. Let your children delight in all the wonder of the season…and hold tight the truth that this is the story that changes everything. Do not miss the enormity of this truth: God became man. Take all your sorrow and longing, all your delight and joy and remember that you are remembered and loved by. God willing to become man to save you. “Christmas itself is by grace. It could never have survived our own blindness and depredations otherwise. It could never have happened otherwise. Perhaps it is the very wildness and strangeness of the grace that has led us to try to tame it. We have tried to make it habitable. We have roofed it in and furnished it. We have reduced it to an occasion we feel at home with, at best a touching and beautiful occasion, at worst a trite and cloying one. But if the Christmas event in itself is indeed – as a matter of cold, hard fact – all it’s cracked up to be, then even at best our efforts are misleading. This originally was posted in 2013, yet the words hold true today…. 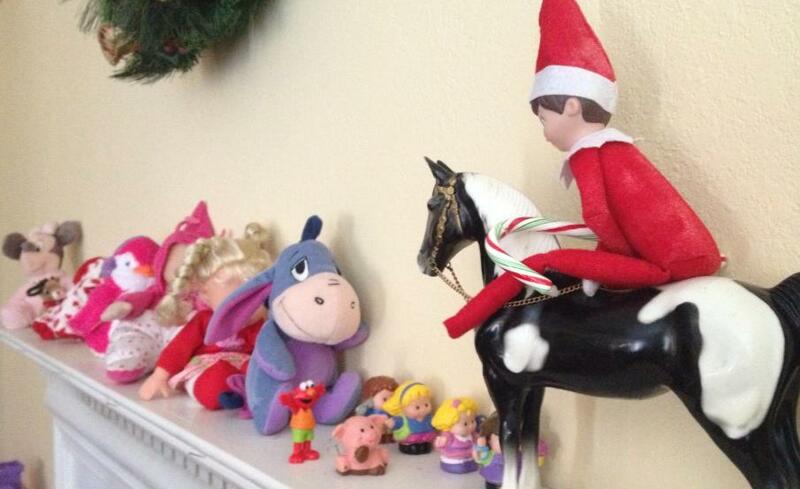 This year a little elf doll has made an appearance at our house. This is the first time we have taken part in the whole Elf on the Shelf phenomena, and we only did because two boys asked. They asked with this sense of wonder in their eyes and this delight. And now, each morning they immediately make a search for where this little stuffed toy has settled. This will be part of their memory of Christmas. This will be part of their tradition. Along with bundling up and loading in the truck with hot chocolates and popcorn to drive through the city and look at Christmas lights. Listening to Christmas music. Practicing for the Christmas program at church. Decorating the Christmas tree and the house. All of these combine to create an atmosphere that stands out as special; as infused with wonder and something different. I remember the Christmases of my childhood. I remember lighting the luminarias and setting the table for Christmas Eve. I remember the anticipation, looking over the presents under the tree a hundred times. I remember the delight in looking at all the ornaments and sitting and staring at the tree with all the other lights in the house off. I remember the special food, the aromas and the scurrying around the kitchen. I remember the little cinnamon rolls that came out only at Thanksgiving and Christmas. The special Christmas china and the red and green goblets. Velvet dresses and Christmas sweaters and shoes that pinched. Acting out the story of the coming of the Babe in the Manger. Loading up in the car and heading to the Episcopal church downtown for midnight mass and remembering the hush that fell upon that place and the sense of awe. Christmas morning was fun, but all that led up to it is more imprinted on my memory than the gifts and opening presents. Everything was set to perfection, and I know there was stress involved, but it was set to perfection with a sense of delight, to lavish and to create a sense of the special. Now…the one who was at the helm of setting the tone and the table is lost in a place where she does not even understand the meaning of the word Christmas. We have not had a meal like that in years, and Dad has not celebrated Christmas in quite the same way in some time. Of course, Grandparents pare things back, but we have set aside the wonder because she does not understand. Until this past Thanksgiving…my brother and his wife brought Thanksgiving to my folks’ place. 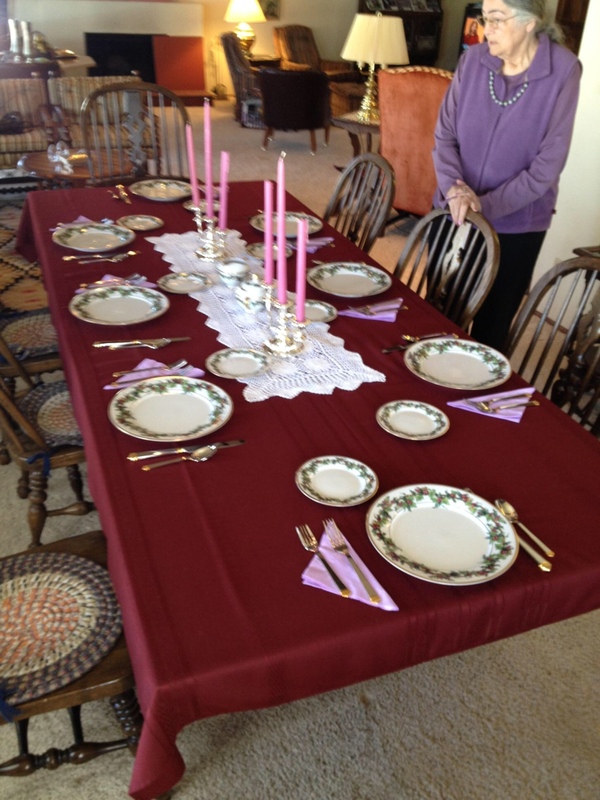 Dad set the table and each piece was still able to carry memories. It is amazing how these inanimate objects bear our thoughts and hold our emotions, releasing a flood of memories just by being brought out into view. Now Dad walks through setting the pieces out, and Mom shadows him. She takes some pleasure in seeing the pieces, but she no longer is the one setting the tone. She no longer is the one welcoming the guests with beaming smile. She is no longer orchestrating. I realized something. I have many friends for whom the holidays are truly difficult, and I imagine that infusing wonder into those moments can be daunting. Seasons which invoke feelings of dread and fear and depression, or where loneliness is the dominant emotion rather than wonder or joy…these are not seasons marked by memories of anticipation and hope. Rather, they might be seasons where we want to simply close the door and ignore. I would offer that all the more, though, we need in those moments to affirm the irrationality of Christmas, as Madeleine L’Engle says. In the midst of the terrors and the depressions and the fears and the angers and the hopelessness….in the midst of those is where we need to hear the wonder. We can manufacture some sense of wonder with Elves on Shelves and twinkling lights. Enough to capture the attention of the five year old, or even the ten year old. Enough to enliven their imagination so they have memories to look back upon as they age. Enough to spark their wonder. But, they are mere glimpses of wonder, and they do not sustain. Let the children play and enjoy…and spark their wonder. Then, remind them of the One who tells of the truest wonder of all. When the true terrors of reality come, we need the irrationality of Christmas. We need the imagination of the God who has the power to overcome, and to birth true wonder. When I am able to pray with the mind in the heart, I am joyfully able to affirm the irrationality of Christmas. Advent failure? Meet the Relentless God. I posted this two years ago, but the title struck me this morning. We are in a similar situation in 2016, and yet God continues to be relentless. Relentless in loving us, in calling us, and in meeting us right where we are. So forgive the reposting….but the truth remains. The theme for my Advent Season 2014? We have not read the Advent books, we have not faithfully made our way through our Advent Calendar. We have not opened the book of creative ideas for inspiring the children through this Advent season. The kids have played too much X-Box and computer. I have lingered on FaceBook longer than I should. The laundry basket just seems to stay full of clothes that need to be put away. Presents are just beginning to appear under the tree. Not sure everyone is even in what they are receiving. Tamales made that turned out so-so rather than really great. Frustrating. These are the things that run through my mind…little failures where I can see what could be. I can see more wonder and hope and joy and peace and love. I can see more order and more patience, rather than haphazardly bumping my way through the season. More than that though: frustration, anger, impatience, arrogance. Sin. Throughout the season. The reality of my fallenness. The reality of my lack. The reality of the brokenness we sit with as we try to take in the wonder. The reality of a Mom who slips farther from reality. The reality of friends truly struggling simply to have the basics, let alone the luxury of Christmas gifts overflowing. The reality of others struggling with life-consuming illness. Fear. Uncertainty. The realities that sometimes cloud our hope and faith and love and peace and joy. I can slip into a deep awareness of my lack, and be overcome by it. My fears and failures demand attention….and then I realize that God is more relentless than my fear or my laziness, or my uncertainty. God simply will not be overshadowed. Every year, every where we go, God is proclaimed. Maybe it is covered over with too much fluff, and He is made too safe. Maybe the Gospel is a bit softened by the Ho, Ho, Ho’s. Maybe it is a little confusing…and yet, it is still relentless. Beginning in November the stores start proclaiming: Christmas is coming. Maybe they are not aware, but they are also proclaiming: Christ has come. The songs start playing the decorations go up, all around us. The parties start being planned, the gifts being wished for and listed, the food starts being prepared. The performances being. The familiar choruses begin being sung on Sunday mornings. Relentless reminders: Emmanuel. God has come. Every year, no matter the failures or the frustrations, no matter the fears or the angers, no matter the weaknesses on my part…God reminds me He came. I may not make it through the whole Advent season with focused intent and awareness, I may not even make it through with a clean house and presents bought on time. Doesn’t matter. No matter how your Advent season has progressed, the reminders are all around us. We can soften them with our trivialities, or be overwhelmed by the demands of the season…but the reminders still stand. Relentless. God keeps reminding us He is near. Underlying all the decorations and Ho, Ho, Ho’s…the reality that the God of the Universe came. That is staggering, and even though we may be so familiar we shrug off the reality…He keeps tapping us on the shoulder each Christmas season. There is a deep truth that underlies all the decorations, and it is amazing. I am so thankful He is relentless. Christmas itself is by grace. It could never have survived our own blindness and depredations otherwise. It could never have happened otherwise. Perhaps it is the very wildness and strangeness of the grace that has led us to try to tame it. We have tried to make it habitable. We have roofed it in and furnished it. We have reduced it to an occasion we feel at home with, at best a touching and beautiful occasion, at worst a trite and cloying one. But if the Christmas event in itself is indeed—as a matter of cold, hard fact—all it’s cracked up to be, then even at best our efforts are misleading. Came down. Only then do we dare uncover our eyes and see what we can see. It is the Resurrection and the Life she holds in her arms. It is the bitterness of death he takes at her breast. Joy! Flashmobs! The Light has Come! One of my favorite things this time of year is scrolling through YouTube and watching FlashMobs. The one above, in Seoul, I love because of the language barrier. The songs are still familiar, however the language difference allows me to hear afresh. I love the expressions of the people. This next one, in the Boston Museum of Fine Arts, just amazes me. The singer is so talented, along with the musicians, but the words. Oh my soul. This season, the Word of God, the announcement of God with us…it is sung out in the most unlikely places. This one, in German, stretches my language again while still the music is familiar. Again, Hallelujah’s ring. Again the announcement that Christ has come. This Advent business is not simply anticipation for us. We know the end of the story. We know He comes, and we know He changes everything. We know that He brings healing, brings hope, brings wonder. This Advent business is about joy alongside the anticipation. We still need to learn the art and discipline of waiting through this season…of quieting our hearts and being aware of our need. But…sometimes the joy just has to come out. Because this is good news. This great mystery of the Incarnation. We need the days of Advent to allow the space and time for this truth to soak us again. The reality of God with Us. Emmanuel. In the midst of dark days, in the midst of loneliness…God has come. Rejoice! Find that balance this season of quiet anticipation and joyful exuberance. One of the deepest realities of Advent is an awareness of our need. Part of the waiting, part of the anticipation, we sit with our need and become more aware of the longing within us. We make the space to contemplate and to listen, to be still and recognize our need. When we rush to Christmas morning, we miss the longing. We rush right up to the birth and think of how cute Baby Jesus is with the cows and camels nudging him softly. We ooh and ahh at the nativity scene. He is familiar and good and sweet. We miss the longing, we miss the absolutely stunning wonder, that God has come in our midst. The Jews had waited. The years between Malachi and the coming of Jesus were filled with warfare and kings, from Alexander the Great to Ptolemy to Antipater and Pompey. Ultimately Antipater’s son Herod the Great sits in rule over Judea. The people had been tossed and turned between violent men. Their identity had been questionable as some of them assimilated more with Greek culture or tried to legalistically hold on to what made them distinctively Jewish. They had to be a weary people. I have read that Jerusalem has been battled over, conquered, destroyed and captured 27 times. The area of Palestine has been fought over countless times. The people were weary. They needed hope. In the midst of this, think of the whisper of hope, fulfilling prophecies they had to think were crazy. Mary. Visited by Gabriel. Bringing forth the Son of God. In the midst of such a weary time, how must that have sounded to her. Not another king coming in battle, but something so completely different. A rescue so contradictory to everything. Have we lost sight of that a little, in the rush of the holidays? In the rush of life. Have we lost the awareness of a deep longing within us for things to be set right? Have we looked at the babe in a manger with oohs and ahhs rather than stunned amazement at the plan of God? Before we can rejoice in the hope we have to know our need. Sometimes that is as simple as recognizing our lack of belief. Sometimes that is as simple as rolling out of bed and being aware of the challenges of our life again. The suffering around us and the sorrow within our own families. Sometimes, though, we need the help of our poets to spur us toward prayer and anticipation. We’re only six days in to Advent. There is plenty of time to listen, to wait and to hope. Settle yourselves and allow the need to be present so we can rejoice in the hope that God has ‘come to us here, who would not find you there’. Malcolm Guite helps with this, and you can click on the title to hear him read. The weekend has worn me out, along with the three-day-old headache. Mondays following a travel hockey weekend always feel distracted. The need to get my footing back in line with the normal routine. December is not normal, though. December is laced with wonder, alongside the stress of holiday preparations. They seem to compete through the month. It is difficult to maintain imagination and wonder when you are stressing about holiday events, food planning and parties. These things which should add to our wonder sometimes, well, wear us out. Yep, again, the season of Advent tries to quietly draw us in to something different. Something more centered in peace and allowing the space to as fully as possible grasp the reality that God is with us. The holiday season of culture is filled with noise. There is delight and fun, but oh my soul is it noisy. Looking outside the sky is grey today and there is a stillness that is trying to get my attention. Trying to get through the distractions and settle my soul in to listen. Advent does not yell and force our attention. We have to be quiet enough to listen and pay attention. That is difficult on Monday mornings with pounding headaches and dirty dishes, running out the door to the next appointment. Still, even there…there is space for quiet. For imagination. For Advent. Stretch a little today. Stop the noise and turn your attention to the need we have for a savior. The need we have for redemption and rescue. Turn your heart toward what Mary might have been thinking and experiencing. Turn your heart toward the wonder of Advent. “It came to me, recently, that faith is “a certain widening of the imagination.” When Mary asked the Angel, “How shall these things be?” she was asking God to widen her imagination. All my life I have been requesting the same thing-a baptized imagination that has a wide enough faith to see the numinous in the ordinary. Without discarding reason, or analysis, I seek from my Muse, the Holy Spirit, images that will open up reality and pull me in to its center. Waking up in a hotel room this morning makes focus on Advent a little more challenging. I miss my front porch, sitting and sipping coffee in the chill of the morning. I miss the routine of being home and all that is familiar. There are no decorations here. The room is the usual stark older hotel room, lacking personality. This space does not draw me in to contemplation and anticipation. It draws me in to slumber and little else. Still. This is Advent. Here in this space. I wonder in those months leading up to Jesus’ birth what the anticipation was like. Joseph and Mary. A God in her womb. How do you even begin to anticipate that reality. I remember each of my pregnancies, and with the first I remember a moment of near panic attack. The realization that this baby had to come out; I had to give birth and there simply was no turning back. I remember the drives to the hospital and the building anticipation of meeting this new little person. We did not know the sexes of our babies, so there was always a deep anticipation and excitement, wondering who this little one would be. Can you imagine the anticipation of Mary? How overwhelming that must have been. She must have wondered if this baby would look different than all other babes…this little infant who carried Divinity. This little One who would change everything. Taking today to think back on the births of my children and the emotion embedded in that experience. Thinking today of how each of those births changed our lives. Thinking today of the anticipation that marked each birth. Thinking of how amplified that must have been for Mary. The following poem from Luci Shaw helps me. Draws me in to the fact that Jesus was in Mary’s womb for 9 months. That is something I rarely think of…I always meet Jesus right at his birth. Mary knew, though. She had that 9 months of anticipation. Even in a sterile hotel room, the reality of God with Us can change everything. To the crush and cry of birth. Part of his body, I transcend this flesh. From his sweet silence my mouth sings. Out of his dark I glow.